The following story is taken from the book "Samurai no Tsubasa (Wings of the Samurais)", by Eiji Suzuki, a war correspondent who followed the JAAF in Burma. He followed the action of the 50th and 64th Sentais and flew many bombing sorties on Ki-48s and Ki-21s of the 8th and 12th Sentais. The following is about Master Sergeant Shiro Hayashi, who is described as the best Ki-48 pilot of the 8th Sentai. Shiro Hayashi was a tall (for a Japanese of that period at 177cm) man with a beard, but his face looked very gentle, almost feminine. He was orphaned when he was three years old, and was raised by his aunt until he finished elementary school. Thereafter he lived in a drugstore in Daegu. Korea where he also worked until he joined the Army. He was a smart child, but perhaps because of his family background, was somewhat of a problem child. Whenever he was chided, he would not speak with the couple for days at times. He once even ran away from the drugstore with the money he collected on a delivery and roamed around northern Korea for 3 weeks until caught by the police. However, the couple who kept the pharmacy pleaded with the police not to prosecute Shiro because to them he was family. He was endeared especially by the drugstore keeper's wife who, after Hayashi joined the army and was placed in a cavalry division in 1936, visited him every Sunday with a box full of homemade sushi rolls as well as sake for older soldiers of the unit. After he became a pilot, he was stationed in mainland Japan, Taiwan, Philippines and Burma, and never saw her again, but her letters, which were always written on scrolls in beautiful calligraphy (rare even in those days), followed Hayashi to his bases, who was very proud of them. Hayashi had once told this story to Eiji Suzuki who apparently wrote a story for the Yomiuri Shinbun describing how the couple's love turned a renegade boy into the "bravest pilot of the Sentai". The following account indicates he was "brave" in more ways than one, and that the "problem child" was still very alive and well inside Hayashi. On one sortie in the autumn of 1942, Shiro Hayashi was heading towards Chittagong to attack an airfield. Some 120 fighters and bombers were involved, and the bombers made a high level attack on the airfield from 4500m. As the bombers, now free of their bomb load, headed home, M. Sgt. Hayashi's plane veered away from the formation and headed back towards the enemy lines. There was no radio call from Hayashi, and back at the base, there was an air of uneasiness about the missing plane. However, Hayashi and his crew were in midst of a terrific action. The following is his story. 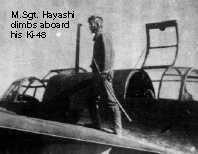 During the initial bomb run, Hayashi's plane had not yet dropped it's bomb load. When Hayashi saw the formation leader's signal, Hayashi turned the bomb release key over Chittagong airbase. However, nothing happened and the bombs stayed in the bomb bay. "Flight engineer! The switch is dead!" hollered Hayashi. The flight engineer (a sergeant whose name is not recorded) hurriedly started working on the switch, but it was too late. The bombs released by other planes were already hitting their targets, and a wild dogfight between intercepting Hurricanes and the escorting Hayabusas was going on above him. No one in his right mind would turn back into the melee on a single bomber. That was suicidal. A frustrated Hayashi sat in the cockpit, keeping his place in the formation. However, as he flew, the weight of the bomb stuck there in the bomb bay seemed to get heavier and heavier and Hayashi's frustration kept rising. "The switch is fixed now sir!" the sergeant reported. When Hayashi saw that the sergeant was almost crying, taking the failure of the switch as his responsibility, Hayashi made up his mind. He veered off the formation and headed back alone to the enemy base. Hayashi's plane was soon over Chittagong at 3000m. The dogfight between the Hayabusa and the Hurricanes was now over, and he saw two Hurricanes patrolling at about 5000m. Hayashi judged it was too dangerous to attack the airbase, and looked down to find a train yard just below him. There were dozens of rails in the train yard, and many trains that were changing cars. Among them, he found a long open-deck train. There were trucks and tanks on this train, and they were apparently being unloaded. His decision was immediate. Without hesitation, Hayashi put his plane into a steep dive toward that train. The dive came about so abruptly, rear gunner M.Sgt. Ishida fell off his gun position and was not able to climb back on before the two steep 60 degree dive bombing runs were over. Hayashi's plane carried only six 50kg(110lb) bombs, but that bomb load and the front gunner's fire was enough to throw the train yard into total panic. Some of the train cars started burning. When Hayashi's plane was about to turn back, the two Hurricanes on watch came in to attack. 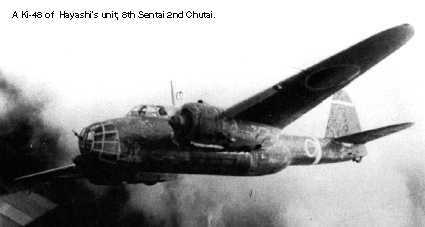 But Hayashi put his plane in a dive for the third time, and started fleeing at extremely low altitude. Because of the low altitude, the Hurricanes could not make diving attacks for the fear that they may run into the ground, nor could they follow Hayashi from directly behind, because of the dangerously low altitude he flew. As M.Sgt Ishida told Suzuki, they were "flying so low, just above those palm trees. The fuselage was actually hitting the treetops and I could hear the leaves brushing against the lower fuselage." But that was not the end of his story. The Sentai commander was very much worried about the whereabouts of Hayashi. As soon as he got off the plane, he waited at the field command post, hoping to hear something about Hayashi. He seemed to be very much irritated as no radio calls were forthcoming. Hayashi's plane came back two hours later. The four crew members thought they were the coolest gang of them all. When they got off the plane, they lined up beneath the wing and started fulfilling their biological needs, laughing and talking. This obviously got on the commander's nerves. When Hayashi finally came up to the post to report the day's action, the commander was silent, and went back to his barrack after hearing the report. Even at this point, Hayashi did not realize that the commander was angry at him. So when a messenger came to his barrack telling him that Hayashi and his Chutai commander were wanted at the Sentai commander's barrack, he thanked the messenger with a smile on his face. A while later, he reported to the Sentai commander in company of Capt. Yamamoto, his Chutai commander. Still at this point, Hayashi thought that he was due for a compliment, maybe not enough for an official award, but perhaps a personal compliment from the commander for his brave action. But the commander came up to Hayashi with a bitter expression on his face. He said, "Master Sergeant Hayashi, do you know what your orders were today?" "Then you know that your Sentai commander has never ordered an attack on Chittagong train yard." "Sure, but I told you how the switch was broken and the bomb didn't fall and how there were Hurricanes over the target, right after I came back!" The Sentai commander went on to scold Capt. Yamamoto for inadequate leadership. The anger inside Hayashi was growing and growing during all this was going on, and he just stood there, barely holding himself back from exploding, and after it was all over, went back to his barrack without even saying he was sorry. Back in his barrack, he cursed in a low voice as he took off his flight jacket. He started to take off his boots, stopped, and then grabbed his jacket and ran out the door. "All right guys! Look! I am going to show you all how to do an low level attack!" Hayashi yelled as he ran. "Yes! Come on! Do it!" hollered the flight engineer M. Sgt. Ogusa, a seasoned veteran with a Kaiser mustache. A dozen or so crew in Hayashi's barrack followed him on. Shiro Hayashi ran across the big airfield and jumped onto his plane which was undergoing servicing. "Off my plane!" he yelled to the maintenance crew. "Get off and start the engine! Come on! Quick!" As soon as the Ki-48 got to the runway, Hayashi started his takeoff run. And when the plane had made only about half the distance of the normal takeoff run, Hayashi took off and started climbing in a startlingly steep angle. It was a feat only Hayashi could do, and many of his fellow pilots thought that the plane will stall on the spot. But not only did he take off safely, Hayashi stood his Ki-48 on its wing and started circling over the airfield at a mere 100 or 200 meters. Hayashi's flight technique was already a living legend among fellow pilots as he had once evaded an attacking Hurricane over India by actually looping the twin engine bomber. In fact, he was punished then too, because looping a twin engine bomber was forbidden in the flight manual. Hayashi's plane was banked 90 degrees to the ground and was making tight circles, like a circus motorcycle that runs inside a ball shaped cage. Then it suddenly shot upwards about 1000 meters like a fighter plane. Then the real "trouble" began. Hayashi later laughed it away, saying that he had "educated young pilots the art of dive bombing", but the Sentai commander would never have been happy about it; Hayashi was diving straight at the commander's barrack! Hayashi came in again and again, making perhaps a dozen dive bombing runs on the commanders barrack which was little more than a hut made of wood and grass. Each time the Ki-48 swooped down, the little hut with the commander in it shook like it was going to fall apart. Those watching on the ground thought that Hayashi will actually dive into the hut, but Hayashi was good. He made enough dive bombing runs to make himself feel better, and then made a perfect landing and walked back to his quarters. Everyone thought that he was in big time trouble, but the commander didn't say anything. In fact he was never again scolded by the Sentai leader. When asked about Hayashi later on, the Sentai commander grinned and said "Oh his one hell of a brave SOB. I had to glitch about leaving the formation and all, but the attack on the train yard is definitely an A-class work. He couldn't turn back with the bomb load. That's good spirit."